A New York Times Bestseller, and the inspiration for the hit Broadway musical Hamilton!Pulitzer Prize-winning author Ron Chernow presents a landmark biography of Alexander Hamilton, the Founding Father who galvanized, inspired, scandalized, and shaped the newborn nation.In the first full-length biography of Alexander Hamilton in decades, Ron Chernow tells the riveting story of a man who overcame all odds to shape, inspire, and scandalize the newborn America. According to historian Joseph Ellis, Alexander Hamilton is “a robust full-length portrait, in my view the best ever written, of the most brilliant, charismatic and dangerous founder of them all.”Few figures in American history have been more hotly debated or more grossly misunderstood than Alexander Hamilton. Chernow’s biography gives Hamilton his due and sets the record straight, deftly illustrating that the political and economic greatness of today’s America is the result of Hamilton’s countless sacrifices to champion ideas that were often wildly disputed during his time. “To repudiate his legacy,” Chernow writes, “is, in many ways, to repudiate the modern world.” Chernow here recounts Hamilton’s turbulent life: an illegitimate, largely self-taught orphan from the Caribbean, he came out of nowhere to take America by storm, rising to become George Washington’s aide-de-camp in the Continental Army, coauthoring The Federalist Papers, founding the Bank of New York, leading the Federalist Party, and becoming the first Treasury Secretary of the United States.Historians have long told the story of America’s birth as the triumph of Jefferson’s democratic ideals over the aristocratic intentions of Hamilton. Chernow presents an entirely different man, whose legendary ambitions were motivated not merely by self-interest but by passionate patriotism and a stubborn will to build the foundations of American prosperity and power. 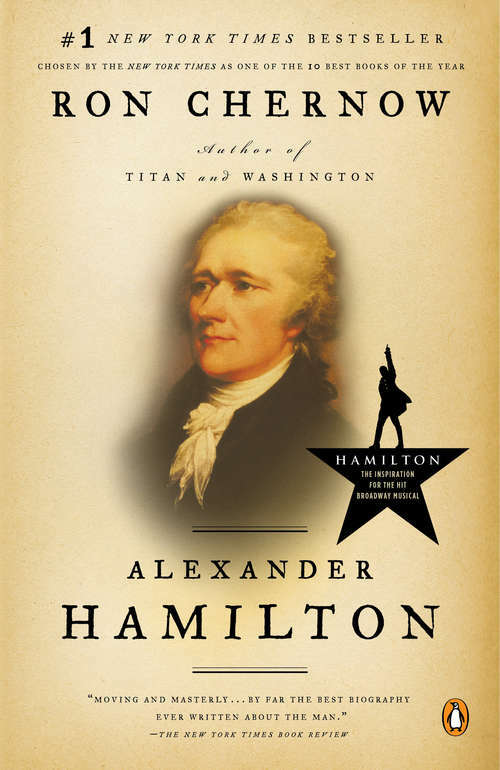 His is a Hamilton far more human than we’ve encountered before—from his shame about his birth to his fiery aspirations, from his intimate relationships with childhood friends to his titanic feuds with Jefferson, Madison, Adams, Monroe, and Burr, and from his highly public affair with Maria Reynolds to his loving marriage to his loyal wife Eliza. And never before has there been a more vivid account of Hamilton’s famous and mysterious death in a duel with Aaron Burr in July of 1804.Chernow’s biography is not just a portrait of Hamilton, but the story of America’s birth seen through its most central figure. At a critical time to look back to our roots, Alexander Hamilton will remind readers of the purpose of our institutions and our heritage as Americans.“Nobody has captured Hamilton better than Chernow” —The New York Times Book Review From the Trade Paperback edition.